This was kind of a weekend of mishaps – in large part due to some really unstructured time management on my part. On Friday night, I was supposed to meet up with a friend for dinner. Unfortunately, on Thursday night, I had gotten less than two hours of sleep – partly the result of me refusing to give up on a social activity that night even though I had work to do, and partly because… there was just so much work to do! All week I hadn’t been sleeping enough, so Friday morning I regretfully texted my friend to cancel and let him know that I was going to be going to bed pretty much the second that I wrapped up work for the day. So we rescheduled for Sunday brunch, and I spent Friday night getting a bunch of work done but largely feeling like I had wasted the night. Strike one. Saturday morning, I woke up feeling at least somewhat refreshed (although I hadn’t gotten to bed as early as I would have liked on Friday night), and I grabbed my gear and headed to the ski slopes. I bought two unlimited ski passes this year – one gets me access to Breckenridge, Keystone, Arapahoe Basin, Vail, Beaver Creek, and the other is for Eldora, a small local mountain that’s just 40 minutes from home. However, I haven’t been up to Eldora at all this season, and I thought Saturday would be a good day to remedy that. I had lots of errands to do in the afternoon, so it seemed like the perfect day to avoid the parking lot of I-70 and ski close to home. Unfortunately, I got there and was only able to do one run – after which the lift ticket guy scanned my pass and told me it was ineligible. “Huh?” I questioned articulately. Turns out that the “super value” pass that I bought was not just blacked out on holidays, but also all Saturdays in January and February. I mean, it was cheap, so I can’t complain, but… ugh. I wish I had realized that before driving up there! So back home I went, now regretting that I had swapped long run Saturday and ski Sunday for ski Saturday and long run Sunday – the opposite way would have worked fine! I spent the drive back trying to figure out if there was any way for me to both run and ski on Sunday, but concluded that since I had brunch plans at noon, I couldn’t fit both in. Strike two. Next up was one really cool part of my weekend: I got to go to Walmart to learn about their new gluten-free product section. I have a few friends who have been diagnosed with Celiac’s disease, and also a few who try not to eat gluten because they believe it’s bad for them, so I appreciated that a ubiquitous store like Walmart is carrying more gluten-free products! 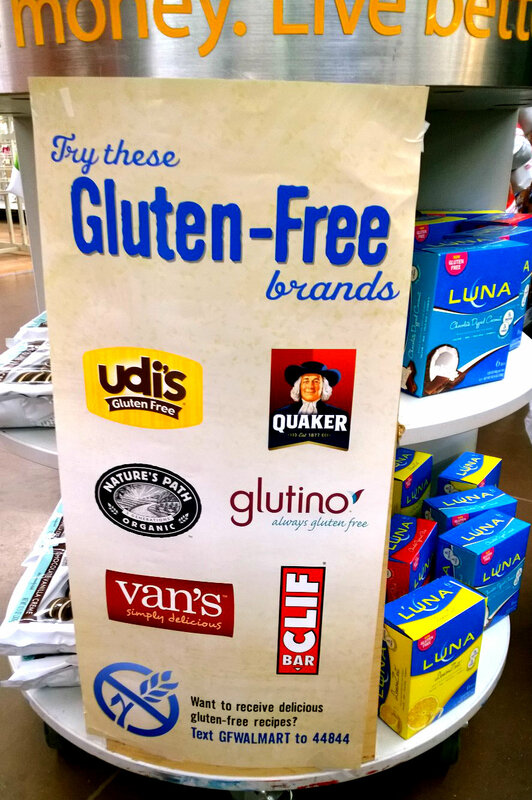 Van’s, Quaker, and Clif Bar are all brands I regularly purchase – and Udi’s actually has a chain of restaurants here in Colorado! Some of their offerings were things that I only buy for certain occasions – frozen pizzas, cookies, etc. However, they also had a large selection of Clif bars – and I am definitely someone who stocks up on bars! One of the main items that Walmart was promoting was Clif’s new gluten-free organic line of fruit and nut/seed bars, Kit’s Organic. While there, I also learned that some of the Clif family of nutrition bars that I already know and love are gluten-free – like the Mojo Bars and some flavors of the Luna Bars. 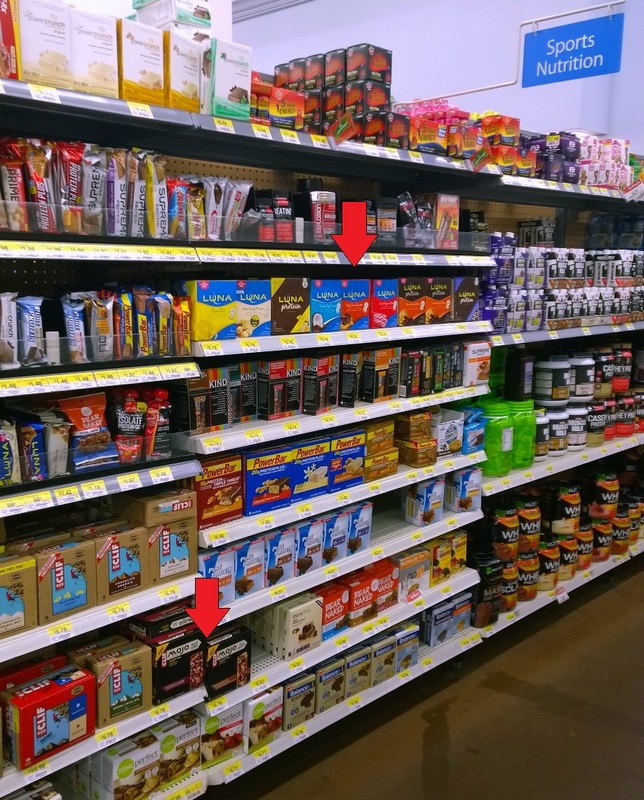 The Luna bars and Mojo bars were a little tricky to find – they weren’t in the new gluten-free section of the grocery store that Walmart recently added. Instead, you go to the “sports nutrition” section by the pharmacy – I’ve put red arrows in the pic to show you the new gluten-free choices. Protein bars have always been a staple for me– I always keep some in my laptop bag, and also one in my purse. When I’m traveling and get stuck with a delay, I really appreciate being able to have one or two bars as a meal substitute, rather than having to buy the expensive snack boxes on the flight (that usually aren’t that good anyway). And even when I’m in Colorado, I appreciate that if errands or meetings take longer than I expected and my stomach is growling, I don’t have to shell out $10 for some fast food meal; I can have the bar in my bag and then cook something yummy when I get back home. Plus, there’s the obvious use that they’re great for fuel while doing outdoor activities! Which leads me to Sunday morning. I could have had a protein bar for breakfast and then gone out for my long run… but I found myself not able to resist getting on my computer and firing off a few emails before heading out. And then answering a few more emails. And then responding to the replies I had gotten to my first round of emails. I was getting a lot done, no doubt… but I had planned to spend the morning running 20 miles, and it was now 10am and I did not have time to do much running before I needed to shower and get myself ready for brunch. So I stayed on the computer and just continued working away, instead of getting in even a few miles. (Probably a terrible decision on my part, especially since it was 60 degrees and sunny and beautiful out. Dumb Laura!) 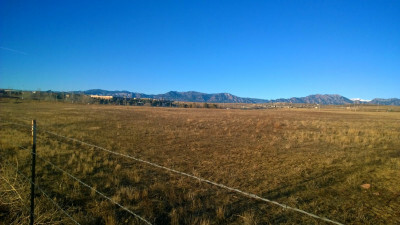 I knew that later I would regret my “all or nothing” mentality, but the point of my run was to get a final 20 mile training run before my marathon next weekend – so the only benefit a shorter run would have had for me would be calorie burn. (Okay, and the intangible benefit of getting out into the beautiful sunshine and seeing the gorgeous scenery in the open space… which is not insignificant.) However, at 11:40am when I texted my friend to confirm brunch, he told me he had to cancel… and I was now really regretting that I hadn’t gone out at 10am, because I would have been able to complete the whole thing if I didn’t have brunch at noon! Unfortunately, the lamest part of my weekend was yet to come – when, driving home from dinner on Sunday night, I was about 1/4 mile from home and some sort of animal darted out in front of my car. 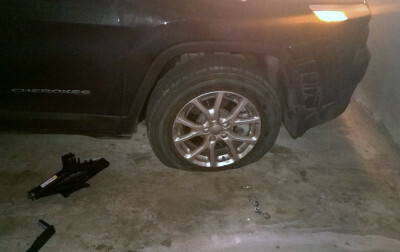 I swerved to avoid it, hitting the curb in the process – and immediately completely trashed my tire. It was 11pm at that point, and I was exhausted, so I chose to go to bed and then deal with it first thing in the morning before work. Probably the right decision, but it definitely didn’t get my week off to a great start to wake up to this mess! I managed to get all the lug nuts off myself, but then couldn’t figure out exactly where to position the jack. The manual was very specific about not putting it anywhere other than the “triangle on the underside of the carriage”… but neither I nor the Geico guy I eventually called to help could find this mythical “triangle”. Perhaps it’s like the Bermuda, and doesn’t exist? On the bright side, it’s all better now, and in spite of all the back-and-forth with Geico roadside assistance (who helped me put on the spare when I failed miserably at doing it myself) and then the tire shop (who ultimately replaced the whole thing), I’ve actually had a pretty productive day. Of course, the flat tire was completely unpredictable and a plan wouldn’t have prevented it. However, I feel like the main reason that my weekend was kind of a fail was because I didn’t really plan it and schedule it the way I normally do. I know that to others, it can seem totally ridiculous how I try to schedule so much of my time. But I really find it so much easier to have a plan, even if I end up changing it and doing something else instead. When I plan my time, I either don’t plan to waste time loafing (if I don’t have time for it), or I timebox that into a very short period – say, I’ll plan to get home from work at 7:30pm and then give myself till 7:45pm to do nothing before it’s time to make dinner or do whatever I have next. However, if I don’t have anything planned to do next, it’s easy to just keep browsing the internet aimlessly (or watching TED talks, or reading blogs, or whatever) for a very long period of time. Chris Bailey over at A Life of Productivity illustrated this principle really well with his discussion of what he calls “springy life elements.” It also brings to mind that old metaphor about the college professor who fills a jar with rocks (“yup, looks full”, says the class), then adds pebbles (“okay, now it’s full”), and then finally he can still fit sand into all the crevices. Everyone has different values, but to me, browsing around the internet or catching up on blogs are the “sand” activities that will fill up as much time as I give them – so I need to get the more critical things done first. Gallagher says that although people say that they enjoy being at home more than they do being at work, on the job they are “much likelier to focus on activities that demand their attention, challenge their abilities, have a clear objective, and elicit timely feedback”, all conditions that “favor an optimal experience”… According to Mihaly, “if left to their own devices and genetic programming”, most people just do stuff like “worry about things or watch television”. It’s times like these that people become unfocused, unmotivated, and unhappy, and begin to “ruminate and feel like their time is being wasted”. To me, that quote just makes so much sense. When do I worry about things most? In the middle of the night, when I’m trying to go to sleep and am not otherwise occupying my mind. How do I stop the worrying? Read a book to distract myself. Giving myself a plan like that helps me focus on what I should be doing rather than spending time on “sandy” activities that don’t matter, or “ruminating and feeling like my time is wasted.” Meanwhile, I am happiest when I’m busy and fitting my schedule together like a game of Tetris. Fifteen minutes here? That’s enough time to email my client about XYZ. Forty minutes free there? Time to write a blog post. Even when I just have one or two minutes free, like while waiting in the checkout line at the grocery store, I like to put it to use by catching up on one or two blog posts in my Feedly reader. I suppose many would argue that I ought to learn to just relax and clear my head, but… I like being busy. And it looks like the science is on my side! Disclaimer: I am participating in a post series with Walmart and Clif Bar to highlight their new gluten-free offerings. I am receiving compensation for visiting their in-store launch and blogging about it. However, I have been a Walmart shopper ever since I was in high school, and I have several dozen Clif Bars (purchased with my own money) on hand at my apartment at any given time – so all the opinions I expressed are definitely authentic! Sounds like you had quite the weekend! I am like you, a procrastinator at heart, but always staying busy! Love that Walmart is now carrying so many delicious brands that are gluten-free! It’s definitely a tough habit to break! I love Clif Bars and can’t wait to try their gf kind! I’ve already had the Lunas and Mojos – they’re yummy! My mother-in-law will be so happy to hear about these bars at Walmart – she often has to search down gluten free products and shop ahead of time before a trip. But we all know Walmart is practically everywhere, so that’ll be awesome for her! Danielle Fouts recently posted…Splash Math: fun math apps for kids! Yes, having them at Walmart will be amazing for so many people! What a busy weekend! I’m jealous that you are in driving distance of downhill skiing:) Love the GF Clifs Bars too … so good! I bet you have been LOVING the past few days of sunshine! I think I actually went out running in a tank top the other day and had to remind myself it is only January. I don’t think I ever get wide-open weekends… I am a full-time teacher. The weekend is the only time to actually get work done. And yes, I am a total planner. Jenny, I’m definitely trying to get better about dealing with it. Thanks for the compliments! What a weekend! At least you could finally chalk it up as productive. :) I like to have wide open days off…. with one big event scheduled. That’s my style. I love the gluten-free options with Clif Bars. So many yummy choices. It makes me happy that Walmart has so many delicious gluten free options now. April, I think it’s great to experiment and see what works/doesn’t work for you. It makes me so unbelievably happy that Walmart is now offering these things!! !